When you think of rustic antiques do you picture a roughly hewn chair with stag horn backs, a table with bent willow legs, or perhaps a beautifully woven basket? For many collectors of this style of antiques, the simplicity and charm of country living fills them with excitement as they search for the perfect addition to furnish their home or add to their collection. As described by the Cherry Gallery, these roughly finished furniture pieces, such as Adirondack and Folk Art creations, do not have any maker's marks or signatures, as it was not common for early artists and furniture makers of that era to sign their works. Each unique item was handcrafted from nature, using branches, burls, tree bark, roots, animal horns, and other natural gifts, and each one has withstood the test of time. Based on individualized artistic characteristics and style, it is possible to match some of the furniture creations with their makers. This is done by comparing the design of the piece, the materials used, and the techniques of construction to known works by certain furniture makers. Three of the better known furniture makers of the time were Ernest Stowe who lived in the Adirondacks, North Carolina's Reverend Benjamin Davis, and Thomas Molesworth who was from Wyoming. The popularity of this natural country style furniture led to the development of companies that manufactured items that were typical of rustic designs. One of the most famous mass producers of the time was the Old Hickory Furniture Company. Today, rustic antique furniture is often identified using pictures from old catalogs such as Old Hickory. Many rustic antique collectors enjoy searching for unusual household objects such as handmade Amish baskets, clocks fashioned from twigs, old metal sap buckets, or wooden dough bowls. Some of these collectors use their cherished finds in their everyday life, while others prefer to use them only for decorative purposes. These types of everyday utilitarian antiques add touches of rural life to any home, whether it is completely furnished in a rustic style or not. It is not uncommon to find a collector that blends these treasures into a home decorated in a different manner, such as French country, cottage chic, or contemporary. There are a number of antique collectors of rustic design that completely furnish and decorate their homes using only authentic items from that period, while others choose to blend antiques with rugged country style reproductions. 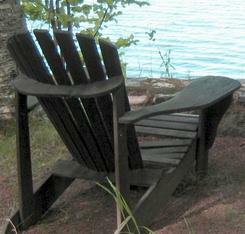 There are many skilled craftsmen today that create handmade rugged furniture in a true authentic manner, such as Adirondack or Western. Other craftsmen choose not to replicate the original styles, instead they create individual pieces that are true to the rough, rustic style but are unique and unusual in design. These craftsmen include Jeff Keyes, Paul Dumond and Matthew Agnostinis, all well known for their work in rustic furniture design. There are many wonderful rustic antiques that have been weathered by time to add beauty and character in an outside garden. Imagine sitting on a century old Amish handcrafted barn wood, garden bench as you gaze at your climbing roses weaving their way through a hand wrought-iron trellis from years gone by. Many collectors of this type of garden antique use pieces such as cast-iron garden figurines, Amish tin barn stars, and wooden spades to give their gardens a touch of rustic charm and whimsy. Often collectors look for architectural items to use outdoors or in garden areas as well. These pieces include hand-hammered wrought-iron gates, fencepost bird houses, and wooden doors. If you are thinking about becoming a collector of rustic antiques, it is very important to educate yourself on the specific types of items that you are interested in collecting. Learning how to tell the difference between an original antique and one that is a reproduction is an essential aspect of collecting. There are many books and online articles available that have illustrations and information to make you an enlightened rustic antique collector.